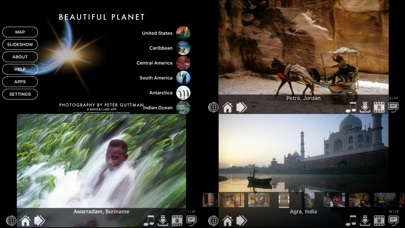 Beautiful Planet includes 700 map-integrated images spanning seven continents and 170 countries, each with Peter's vivid description capturing the moment. 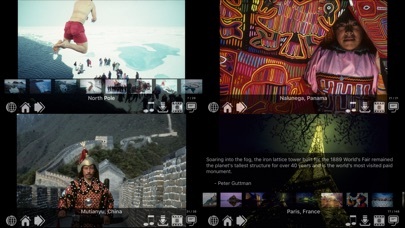 * Featured on Wired.com as "One of 5 Sweet Apps for your iPad" and on NBCNews.com as One of 8 Outstanding Apps for Students. * Featured by Apple in Travel Top 10 Staff Picks, App Store Travel Essentials, Staff Favorites, Apps for the Great Outdoors, Planetary Science, and Great Coffee Table Apps! * Includes a fully interactive, zoomable map, beautiful galleries combined with Peter Guttman's poetic writing. 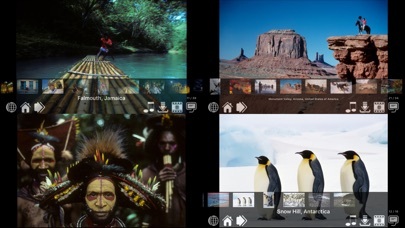 * Scholastic.com named Beautiful Planet an app for the "21st Century Classroom" and described it as "a visually stunning photographic tour of 170 different countries". 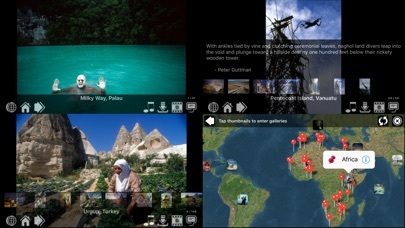 ** Wired.com named Beautiful Planet a Top 10 iPad App they were most excited about! Each photograph is accompanied by Peter Guttman's description of the moment when each photograph was taken. Includes a built-in music player to listen to your iTunes music while you use the app. All at once a savvy encyclopedia of the world, a striking art gallery, an evocative poetry selection and an inspiring travel planner, Beautiful Planet is a lovingly curated, incisively written and joyous portrait of the planet -- a rich resource of knowledge about the wonders of the world around us. ** Reviews of Peter Guttman's work ** * "Stunning images...sumptuous, dramatically lit shots." -- New York Times * "One of the premiere travel photographers." -- CNN * "Guttman's photographs capture the spirit of a place." -- Time * "Such a beautiful vision." -- CBS This Morning * "His photographs all seem to glow from an inner light." -- Dallas Morning News * "Peter Guttman is a gutsy photographer who has taken pictures all over the world and paints glorious word-pictures with extraordinary photographs." -- Popular Photography *** About Peter Guttman *** Two times named the Lowell Thomas Travel Journalist of the Year, called a "one-man Explorers Club" in the New York Times, and with zero inhibitions, Peter Guttman has blanketed the planet to create a far-reaching survey of both nearby dazzling landmarks and unknown, intriguing corners of our terrestrial home. The author and creator of a hardcover award-winning book series for Fodors Travel Publications, an on-air expert for the Travel Channel and A&E Television and the recipient of solo photographic exhibitions at Sotheby's and the United Nations, Peter Guttman skillfully introduces the user to the marvels of our planet. *** Honors and Awards *** * Twice selected by Apple as an "iTunes Staff Favorite" * Featured as an "iTunes Rewind 2010 Top Ten in Travel" * Featured in new iTunes "Classic Coffee Table" section. 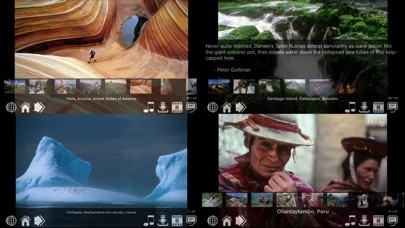 * Featured app for the iTunes "Apps for the Great Outdoors" section. * Winner of the 2010 "Northern Lights Award for Excellence in Travel Journalism and Photography". * Named one of the Top 5 Summer Vacation Apps by tipb.com * Proclaimed "One of Five Sweet Apps for your iPad" and one of "Ten Apps We're Excited To Try" by Wired.com * Named a "Top 10 iPad App for Education" by BrightHub.com * The Top Selling Travel Photography App in the App Store Travel category Photographs and image description are Copyright 2012 Peter Guttman and legally licensed by permission of Peter Guttman.